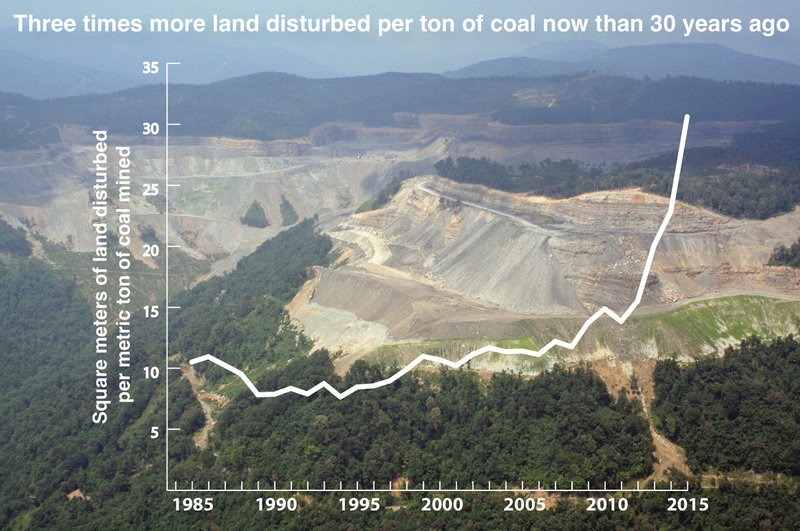 Surface mining, including mountaintop mining, has been responsible for clearing 2,900 km2 (~720,000 acres) of land between 1985 and 2015, or 3.5% of Central Appalachia. When coupled with an earlier dataset covering the mid-1970s through 1984, the total amount of cleared land due to surface mining reaches 5,900 km2 (~1.5 million acres), accounting for 7.1% of Central Appalachia—or one out of every fourteen acres. Put another way, the total area is roughly three times that of the Great Smoky Mountains National Park. In the 1980s, 10 m2 (~110 square feet) of land was disturbed per metric ton (2,200 pounds) of coal produced. By 2015, 30 m2 (~330 square feet) was disturbed to produce the same amount of coal—a threefold increase. The research team utilized Google’s Earth Engine cloud-based analysis platform, processing more than 10,000 individual Landsat satellite images. Their model identified areas with an absence of forest cover in contrast to surrounding, forested areas on a yearly basis. After excluding known roads, bodies of water, and cities, the team labeled any remaining deforested areas as likely surface mines, validated by manually spot-checking the results against aerial survey photography and other imagery. The semi-automated nature of the analysis allows the dataset to be updated annually. The data created by this study are available for the public to download, visualize, and analyze the footprint of mining in Central Appalachia. A subset of the data is here. For media requests, images, and data visualizations, please see this Press Kit (Google folder) or contact geospatial analyst Christian Thomas, contact below. PLOS ONE, published by the Public Library of Science (PLOS), is the first multidisciplinary Open Access journal, providing a platform to publish primary research including interdisciplinary and replication studies as well as negative results. The journal’s publication criteria are based on high ethical standards and the rigor of the methodology and conclusions reported. The research for this study was made possible by funding from National Science Foundation, Wallace Genetic Foundation, Cornell Douglas Foundation and Foundation for the Carolinas. Christian joined the SkyTruth team as a Geospatial Analyst after graduating from West Virginia University with a B.A. in Geography and Environmental Geoscience. At SkyTruth he works to analyze data and conduct research on a wide range of environmental issues and incidents around the world. In addition to utilizing his background in geographic information systems (GIS), he has helped to design lessons for SkyTruth’s educational outreach program and offers technical and media support for Global Fishing Watch. Andrew is a Research Analyst working at Duke University, exploring environmental policy through the lens of spatial analysis. Andrew received the Master of Environmental Management degree from Duke’s Nicholas School of the Environment in 2016, with a concentration in Environmental Economics and Policy and a Certificate in Geospatial Analysis. Andrew’s science and policy interests include land use change, land conservation, urban ecology, climate resiliency, and environmental justice. Matt received his B.S. in zoology from the University of Washington, and Ph.D. in ecology from Cornell University. As a 20-year staffer at Appalachian Voices, he has worked on all aspects of the “coal cycle” — from mining, transportation and combustion of coal to the disposal of power plant waste. As a nationally recognized authority on mountaintop removal coal mining and coal economics, Matt has testified before Congress and appears frequently on expert panels. Duke University is a private, non-profit, research university located in Durham, North Carolina. Younger than most other prestigious U.S. research universities, Duke University consistently ranks among the very best. Duke’s graduate and professional schools — in business, divinity, engineering, the environment, law, medicine, nursing and public policy — are among the leaders in their fields. Appalachian Voices is a leading nonprofit advocate for healthy communities and just economies in Appalachia in balance with the region’s incomparable natural heritage, and a driving force in America’s shift from fossil fuels to clean, renewable energy. We promote sustainable local economies and defend the land, air and water of our region from the worst environmental threats.